Listening to Buddhist monk Maga — Deputy director of missionary work — explain Buddhist philosophy. 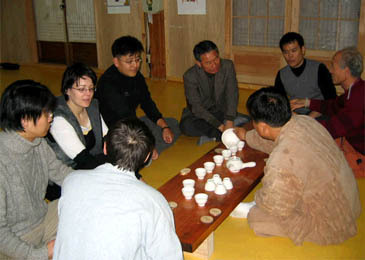 Korea offers many opportunities to experience its rich and varied cultural history. It is a land of festivals, a land of dance and music, a land of martial arts. However, it was with the phrase 'The Land of Morning Calm' mind that I found myself at 3 am last Friday night joining a group of bleary-eyed, slightly sleep bewildered foreign students outside the main building of Magoksa Temple complex on Mt. Taehwasan near Gongju, South Chungcheong Province. A very simple sound had woken us up, calling us to gather in the icy night air — the beating of the temple's huge Dharma Drum in an ever more rapid rhythm. 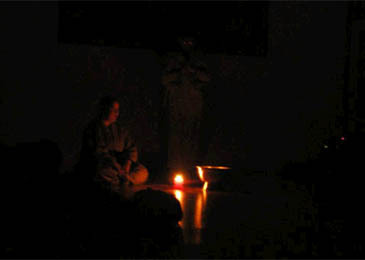 I was listening to that utterly amazing sound — Da Doom, Boom, Boom, Boom — when I was suddenly hit with the acute realization that for hundreds of years, monks and nuns had been rising from the same rooms and completing the same actions each morning as we were now preparing to practice Yebool (Chanting ceremony) and start the temple day. My skin tingled, and I felt that I perhaps experienced more of the mystery of Korean culture in those first few minutes, standing in the frigid air, than I had at any other time during my stay in Korea. Linking arms firmly with those past companions I walked through the night air to Daegwangbojean (main hall) along with the rest of the suddenly silent students. I had joined a weekend temple program at Magoksa Temple on Mt. Taehwasan in Gongju — about an hour and a half bus ride from Seoul. Magoksa is one of the temples that offer intense 'Stay-over' programs of various duration (two days and one night, or three days and two nights). 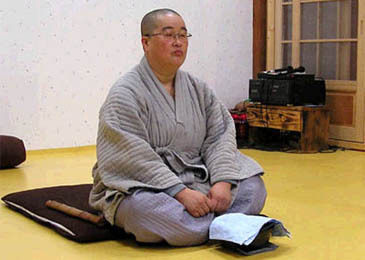 It's a chance to experience Korean Buddhist culture and learn how to practice Seon meditation in a unique environment. At Magoksa, the programs they offer emphasize gaining a deeper knowledge of your mind and inner self. Other temples have programs with a different emphasis on relaxation, expansion of knowledge or to gain simple understanding. The one thing in common is that you are an active participant in the process rather than just an interested spectator. Temple stay Korea came from rather prosaic beginnings. The government, fearing a lack of accommodation for Soccer fans during the 2002 World Cup, asked the Buddhist Temples to help by opening up their doors. 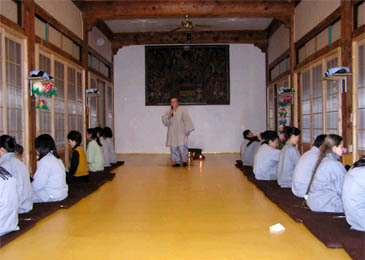 Similar 'Outdoor learning' programs had previously been offered by temples during summer and winter as a way to let both Koreans and foreign residents experience Korean Buddhist traditions. However the World Cup Temple stay venture was such a success that it was continued and has now evolved into the present day Tourist attraction. Yu Sang-Woo, manager of The Committee for Buddhist Temple Stay, said that approximately 30,000 people have stayed in temples dotted all around the country this year alone. Next year he feels that the number will be higher. 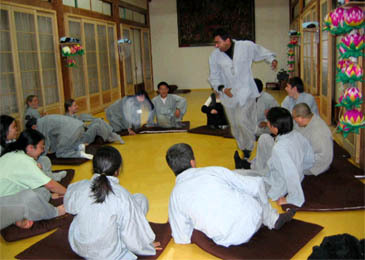 "Both Koreans and Foreigners get a chance to experience the Buddhist way of life together during these stays. It's a unique experience in Korea," Yu said. 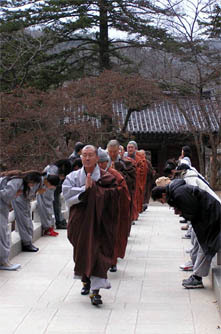 The monks practice three times a day. Once in the pre-dawn at 3 a.m., then again at 11 a.m. and finally at 6 p.m. This ceremony involves chanting and bowing in front of the altar, paying respect to Sakyamuni Buddha, the historical Buddha. The chanting is melodious and even if you cannot understand the words you still achieve a deep sense of tranquillity listening to the chanting. "I've wanted to do stay in a Buddhist temple for some time," said Emma Clynch from Sydney. "I read about Temple Stay Korea on the net while in Spain and we decided to come here for the experience." She and her Scottish boyfriend, Brian Fleming, had arrived a day before our group at the temple. Immediately after Yebool had finished we went for Hang-seon (walking meditation) in the woods. Walking through the woods, on a dark unknown path brings a new meaning to the word 'eerie.' The only sound you hear is the rustling of the trees and the footsteps, and the occasional toe-stumbles of your companions. Gradually it begins to get brighter and as you walk a deep sense of peace pervades over the group. The birds begin to wake up and you hear the beginning of the dawn chorus. "I'm usually on my way home from a night out at this time," one participant said. "It's like a completely different world out here in the mountains." 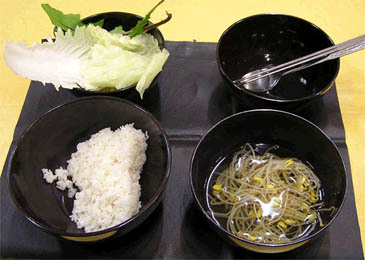 Our breakfast meal, Balwoo-gongyang — a uniquely Buddhist meal of four bowls — is one of the ways of enhancing mindfulness while engaging in mundane daily activity. 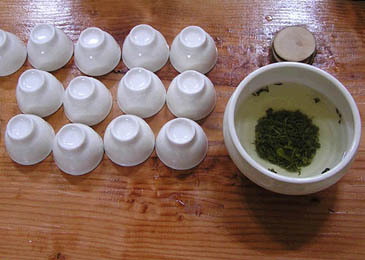 Perhaps it is this mealtime, along with the Da-do tea ceremony (drinking green tea with the monks) more than any other facet of the temple stay that foreigners appreciate the true Buddhist tradition. Each movement is intensely ritualized and is designed to make you focus on and savor each grain of rice and the process it went through to get to you. Because Buddhists are vegetarians, the foods offered were rice, seaweed soup, and various vegetable side dishes; nothing goes to waste, you have to eat and drink everything you receive. After breakfast you have some free time to relax, go back to bed or just wander around the temple grounds. At 8 a.m. group activities began. Sitting in-groups, it is a good time to get to know the other participants as you work together. One rule of Korean Seon tradition is "A day without work is a day without food." Buddhist monks believe that physical labor develops patience and discipline while focusing the mind. Our group was varied, with several International Relations and Language students from Chung-Ang University in Anseong. These foreign students hailing from Russia, France, Kazakhstan, India, and the Philippines all came together to experience the unique Temple program offered by Magoksa temple. "It is good to experience foreign cultures, especially those that are so different from our own," said Marcel Nguyen from Paris. "The monks live a very simple life here. A temple stay offers a chance to experience this life, although I am not sure I could live in such a way myself for more than a weekend." Buddhist monks crossing a bridge to Sunday worship. 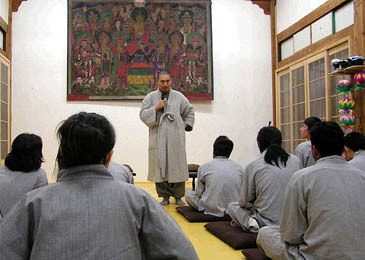 Several times a day during our program we received instruction from Buddhist monk Maga, Deputy Director of missionary work. Usually these instructions taught us how to meditate correctly or give us a simple explanation of Buddhism core ideas. These talks helped us understand more the background and philosophy of a Korean Buddhist Temple. Other temple stays at Magoksa are offered. In the coming month there will be programs designed specifically for Buddhist orphans over the Christmas Day, also one for those who are unemployed, for those who wish to strengthen family life, for new University students and even a program designed for those who need to have a little more charity and less impatience in their lives. Other members of the group included Dr. Young Ui Park, professor emeritus of English at Chung Nam National University, several journalists and two Korean high school students, Seung-Young Baik and Jeong Woo Jo from Dajeon. They told me they were participating "For the experience. We are Korean and this is our culture." The three-day program at Magoksa Temples begins when you cross the Sesimgyo bridge which literally means 'The mind washing bridge.' Crossing this bridge purifies your mind as you enter the temple. Next you pass through the Haetalmun gate where you shake off the mundane dust of the world and then onto the Cheonwangmun gate, where you are judged before crossing Geungnakgyo (the bridge of Paradise) into the Buddhist world. Magoksa temple has a rich and varied history. More than 65 percent of Korea's cultural assets are Buddhist and temples act as living museums preserving architecture, crafts and paintings. 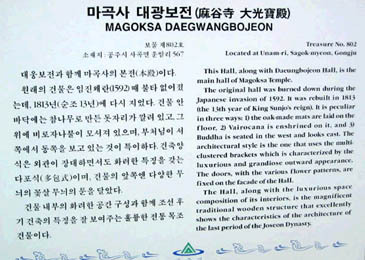 Magoksa has three National Treasures — Daegwangbojeon (main hall, Treasure 802) has a finely woven oak bark mat covering 99 square meters. 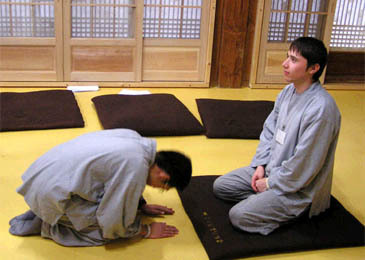 Heh In, our program coordinator, told the temple legend of a crippled man who had volunteered to make the mat after he had spent 100 days of prayer in the hall. After he completed the work it is told that he miraculously stood up and walked away. Magoksa temple also has several very fine examples of calligraphy in the nameplates of individual temple buildings dating from the Silla times. Anyone can participate in a temple stay program. Volunteers are available to translate for foreign visitors on site, and the monks at Magoksa temple provided English versions of all instructions and handouts. You can make a reservation to stay at any temple on the Temple Stay website www.templestaykorea.net or by calling them for more specific information about individual programs on (02) 732 9925. Temple stay programs vary in price from 30,000-50,000 won (about $28-$46 US) for the basic program and 50,000-250,000 won (approximately $46-$234 US) for more specialized programs. 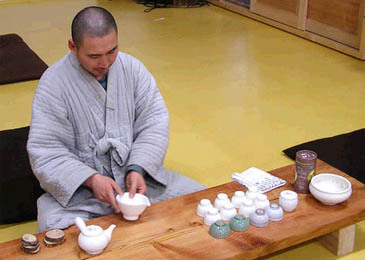 Buddhist monk Maga — Deputy director of missionary work — prepares for Tea ceremony. 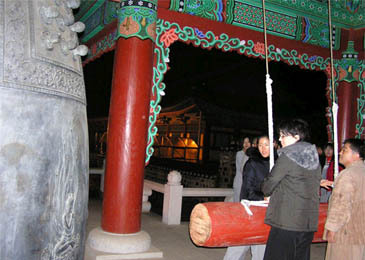 Ringing the temple bell at 3 a.m.
New Year Deep in Mountain Temple? "A Warm and Thoughtful Story"
"Light on Snow" and "Eleven Minutes"
Huntington's New "Clash of Civilizations"
Edel Codd, a writer and avid reader, is currently working as staff writer for The Seoul Times. Having lived two years in Wonju she is currently working on a collection of short stories. Edel has a BA of History, Sociology and Politics from the University College Galway in Ireland.